The main event will see a battle of undefeated fighters as Sean Brady (8-0) faces Gilbert Urbina (5-0). Brady 24, from Philadelphia fights out of Renzo Graice Philly and is the former CFFC Welterweight champion. His biggest win came in March, defeating TUF winner Colton Smith by unanimous decision. Urbina 22, from Weslaco, Texas, is the brother of UFC vet Hector Urbina and DWTNCS alum Elias Urbina. 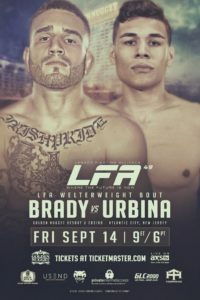 Urbina has won his last 2 fights by rear naked choke, including his victory over Noel Ligon at LFA 7. The co-main event also at Welterweight has UFC vet Jonavin Webb squaring off with Tanner Saraceno. Webb has won back to back fights submitting Isaac Steele & taking a unanimous decision win over Cody Wilson. Saraceno as won 3 straight, all by stoppage, coming off submitting UFC vet Dominic Waters in May. 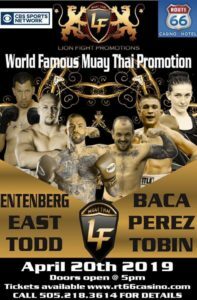 In a women’s featured fight at Featherweight Danyelle Wolf, a 3-time USA national boxing champion makes her highly anticipated pro mma debut against upset specialist, Courntey King, who TKO’ed Colbey Northcutt at LFA 14. Not to mention vicious striker Ahmet Kayretli faces Andrew Salas the winner of 4 in a row.